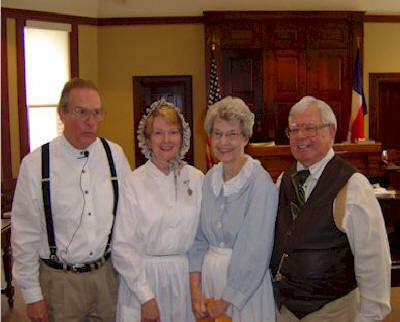 beautifully resorted district court room, narrator Bob Burchard walks the audience through the formative years of Gonzales by having a dialog with early Gonzales settlers.Starting with Empresario Green DeWitt to discuss the founding of Gonzales as the capital of the DeWitt colony, then with the widow Martha McCoy about life in the colony and ending with the emotional portrayal of the Runaway Scrape through the eyes of Margaret Darst.Through all of this there were three facts that all who attended knew at the end of this fine performance. 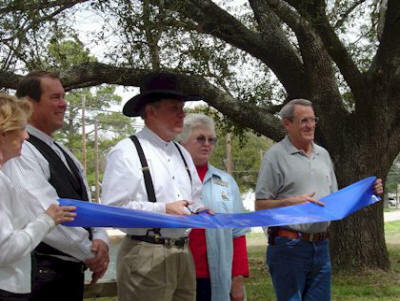 The Texas Revolution started in Gonzales. The settlers at Gonzales had long had problems with the fickle nature of the Indians. Sometimes they were peaceful but many times they were not. In order to protect themselves the Mexican government have given the settlers of Gonzales a small six pound cannon. It had been spiked (the touchhole plugged with a steel rod) so about all it could do after being lighted off by a long fuse down the opening on the barrel was make a loud noise and scare off the Indians. With the talk of revolution in the air General Cos dispatched Lieutenant Francisco Castaneda to retrieve the cannon. When the settlers first heard this they guarded the river crossing and buried the cannon in a peach orchard. The men involved in this incident became known as the "old eighteen". As the news spread more men for the surrounding area arrived. When that number reach approximately 150 the embolden men dug up the cannon, drilled out the touch hole and mounted the Cannon on wheels. Sarah DeWitt and her daughter fashioned a flag of white silk with a representation of the small cannon, a five point star and the challenging words "Come and Take It" . When the morning fog lifted over the river the men waved the flag, "Come and Take It". Not waiting for a response they fired the little cannon loaded with nails and bits of horse shoes with a boom. Castaneda not wanting a confrontation ordered a full retreat back to Bexar (San Antonio). The battle of Gonzales was the first battle of the Texas Revolution. The memorial to those who died in the Texas Revolution located at the Municipal Square on the Southside of the Gonzales County Courthouse. 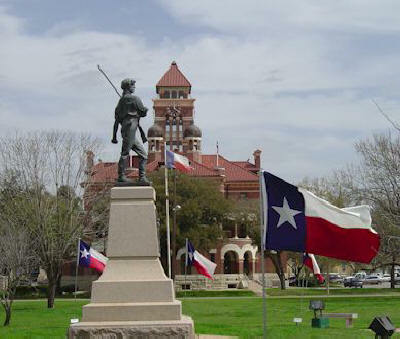 Gonzales was the only town to send reinforcements to the Alamo before it fell. With the arrival of the Mexican army and Santa Anna at the Alamo imminent Colonel Travis sent out many letters appealing for reinforcements. When the appeal reached Gonzales the call for arms was answered. Thirty two men from Gonzales set out to reinforce the Alamo garrison. The men along with nine other Gonzales men already at the Alamo gave the ultimate sacrifice, their lives. Of all the pleas sent out, only the "Immortal Thirty Two" of Gonzales answered the call. The residence of Gonzales were the first to know about the fall of the Alamo. Sam Houston, just days from the signing of the Declaration of Independence, arrived in Gonzales to take command of the Texas Army. Not long after he arrived Alamo survivors Susanna Dickerson, her baby daughter, and Travis' slave Joe arrived in Gonzales to tell of the horrors of the Alamo. Forty-two Gonzales men had perished at the Alamo. Most had family in Gonzales and the grieving was loud and long. among the wives and children. Then fear set in. Santa Anna and his army was coming. Sam Houston ordered the burning of the town to prevent the Mexican Army from gain any benefit from it. They all had to load up what ever they could carry and move quickly toward the Sabine River, the U.S. and Safety. This wave started in Gonzales and moved all across Texas. This was known as the Run Away Scrape.